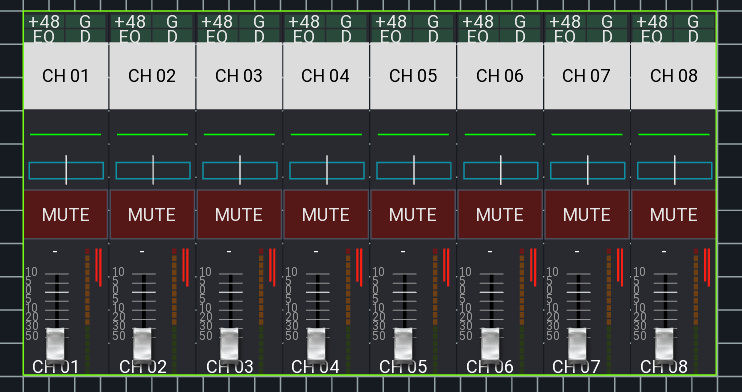 This feature allows you to fully customize the mixer view to match your workflow and create new views for different purposes (e.g. fixed installations). In the app you can create an unlimited number of layouts, each of them has a set of UI elements. Enter the name of the layout - the first layout will replace your default mixer view. Note: Channel Strip is only for fixed channels. Use Mixer to get the channel strips which match the currently selected layer. This settings controls under which conditions the UI will be visible. Shows a container which displays all channels of the currently active layer. This also includes the meterbridge (if enabled in the app settings). A single channel strip which can be assigned to a fixed channel, or a dynamic channel source like the Bus master. Do NOT use this if you want "something that follows the layer" - use the Mixer instead. Defines the text that will be shown on the button. It is possible to write multiple lines of text. See Label Tags for more information. It is possible to change the touch behavior of the button. This can be useful when you want to control a mute group, but only when the button was long pressed. A knob can be used to control a numeric value (like a send level or pan). A label can be used to show values like the current scene or just for showing text. Changes how the text will be aligned on screen.